Here's the other series that ran in the San Francisco Bulletin in 1903. The 'official' title, the one used most often, was The Adventures of Ping and Pong. This one's by a fellow named R.O. Yardley. He not only did this series but a lot of the one-shot color comics that ran in the Bulletin that year. This series ran from February 1 to March 15, missing only one week in that interval. Tomorrow we'll have one last 1903 Bulletin item - probably the very first newspaper appearance by a cartoonist whose name would appear on the nation's comics pages daily for the next half century. R. O. Yardley would be Ralph O. Yardley. still ran a panel by him called "Bygones". and reproduced them under that title. Thanks for the ID and the link, DD! As much newspaper work as he did, I'm kinda surprised that I don't recall ever hearing of him. 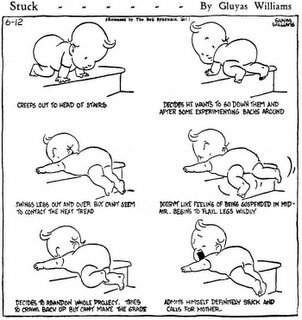 I have some good news today from the exciting world of comic strip research. 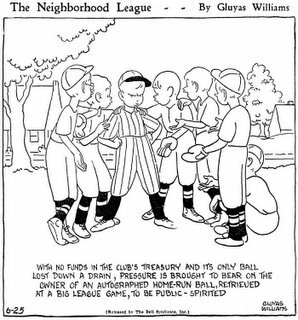 A month or so ago I reported to you that the San Francisco Bulletin ran their own 'homegrown' Sunday comic strips in 1904 - I knew this because of some auctions for a few pages on eBay. However, I ordered the microfilm of the 1904 Bulletin and found no evidence of the strips. That led me to assume that those pages had been stolen out of the bound volumes before they got filmed (unfortunately not that rare an occurrence). I bemoaned the apparent conclusion that the Bulletin's strips were probably lost forever. But hold on there, all was not lost. I ordered the Bulletin microfilm for 1903 just to see what was going on that year, and lo and behold, the Bulletin's comics are all there, including the very ones I saw advertised on eBay as being from 1904. That just goes to show you why I have to see things with my own eyes (or those of trusted advisors and researchers) before information goes into the Stripper's Guide index. Most of the 1903 Bulletin material is one-shot strips, but there are two series. 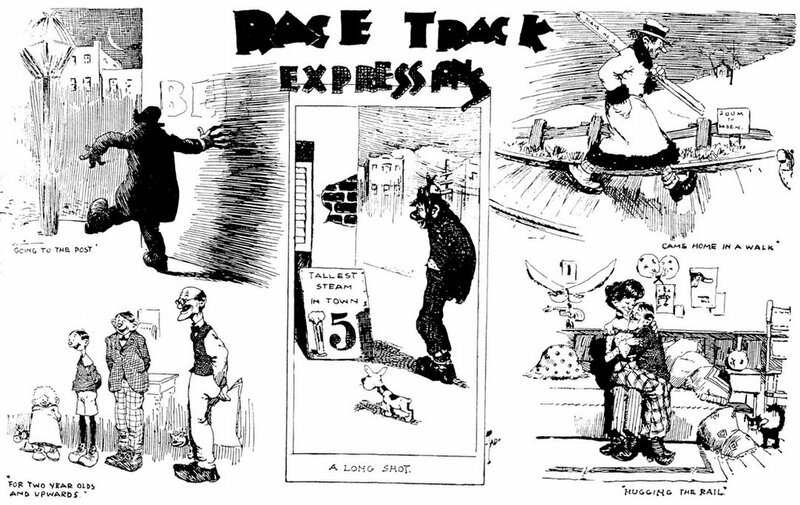 The one shown today, Race Track Expressions by the great Tad Dorgan, ran three times between 2/22 and 5/24/1903. I'll show the other tomorrow. Please excuse the image quality, it's the best I can do from microfilm. Elza Poppin, though supposedly written by the comedy team of Olsen & Johnson, was more likely written by the cartoonists who drew the feature. 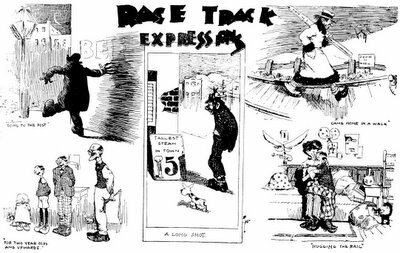 The first artist on the strip was Ving Fuller, a cartoonist who drifted in and out of syndicated newspaper strips on several occasions. 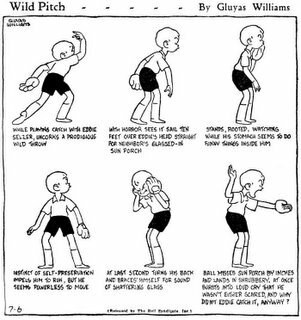 His more famous strip, Doc Syke, was definitely straight out of the screwball school, so Elza Poppin was a good outlet for his talents. 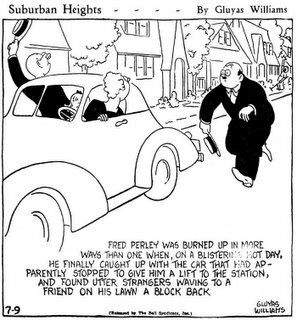 However for reasons unknown Fuller left the strip after just six months, and his replacement was another cartoonist noted for his screwball strips, George 'Swan' Swanson. 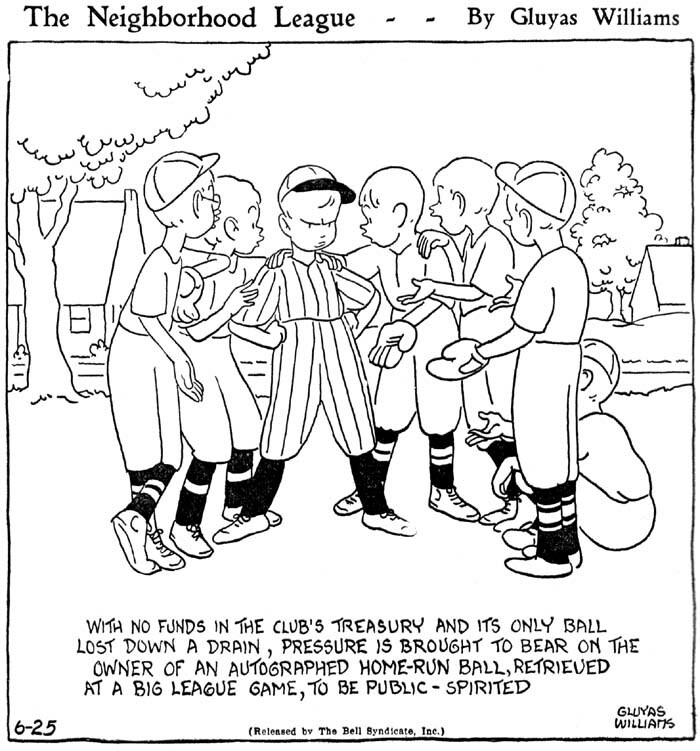 Swanson created one of the first, and best, screwball strips, Salesman Sam for NEA in 1921. He handled the strip until 1926, then switched over to the Central Press Association where he started the daily panel Nonsense and the comic strip High-Pressure Pete. Both features folded in 1937 after respectable runs. 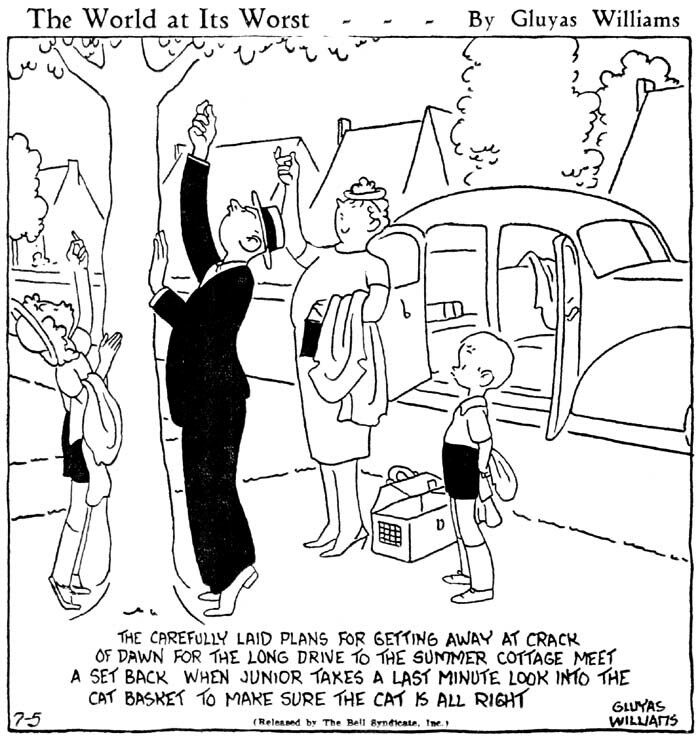 In 1940 Swanson returned to a byline on the comics page by taking over Elza Poppin, a perfect fit for his talents. Any idea what Ving's real first name is? Irving, is that possible for Fuller? I've always assumed it was Irving, don't know if that's cause I read it somewhere or came up with it on my own. I have an original charicature done by Ving Fuller, dated 1924. Is it valuable? Sorry L, I don't do appraisals. I am Swans nephew. I have over 200 pcs. of original strip art in good condition draw by George Swanson.Iremember Swan coming to Cleveland from New York in the summers to draw his strip w/ me sitting on his lap. The zany comedy team of Ole Olsen and Chic Johnson began a successful vaudeville career in the 1920s, parleyed that into a string of successful Hollywood films in the 1930s, and then set Broadway records in 1938 with their madcap stage show Hellzapoppin. Known in their heyday as the biggest competition for the Marx Brothers, the screwball duo had about the same career arc as their better-remembered rivals. The 1940s brought a string of lackluster films and a television show in 1949 fell flat. The 1950s found them in Las Vegas, where they both died in the early 60s. One of the more obscure souvenirs of their career was a comic strip supposedly penned by them and named after their hit Broadway show. The H-E-double hockey sticks was considered too risque for the comics page, so the strip was instead titled Elza Poppin. To explain the name change, a goofy girl character was featured by that name. 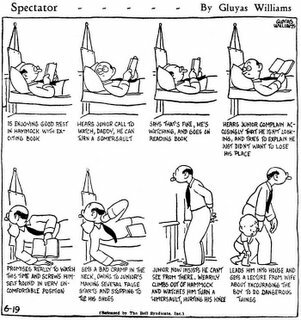 It's pretty doubtful that Olsen and Johnson ever penned a gag for the feature, but their names were enough to put the strip in a pretty respectable list of papers. However, as their fame quickly waned after the Broadway show and a 1941 film version didn't do the show justice, the circulation of the strip plunged. Starting on June 19 1939, the strip gets harder and harder to find after the release of the movie in 1941. Amazingly enough, it held on through April 29 1944, though by then it was only being run by a few papers, like the New Rochelle Standard-Star. You'll find some good material on the Olsen & Johnson team at this website, and here at Wikipedia. An interesting discussion on Hellzapoppin can be found on this blog. 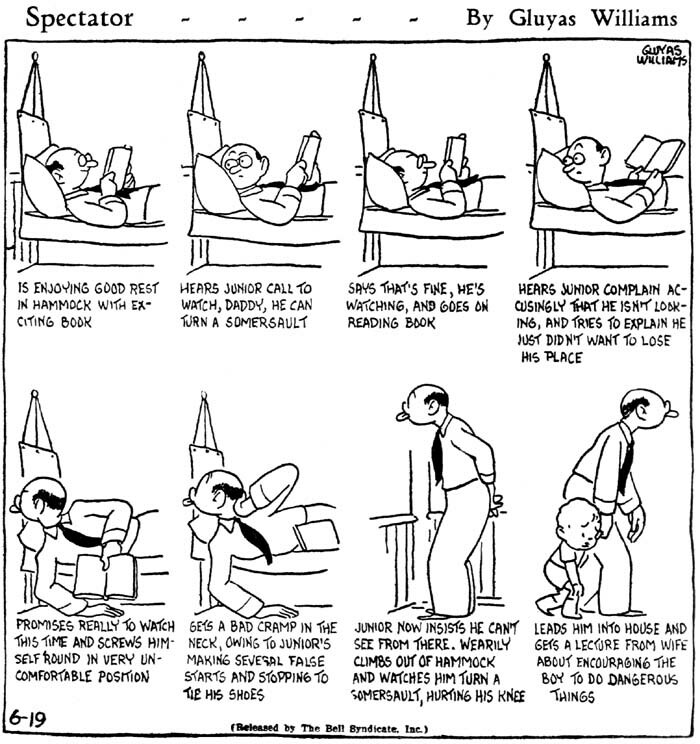 Tomorrow we'll have a few more samples and discuss the cartoonists who worked on the strip. Charlie; Im sure we'll get the lowdown on Swan tomorrow, but yes, he is the Salesman Sam artist. I seem to recall that Elza Poppin reprints ran in FAMOUS FUNNIES, right? Here's another three wonderful panels by clean-line artist extraordinaire Gluyas Williams. If this whets your appetite for more, there are a few reprint books available that, though out of print, are reasonably priced. I recommend The Best of Gluyas Williams (Dover), The Gluyas Williams Gallery (Harpers), or Fellow Citizens (Doubleday). All are readily available on ABE at reasonable prices (here's a link to the listings). Of course, Williams' work also appears in most of Robert Benchley's books, and I give those my uber-highest recommendation. One of the greatest writers of the 20th century in my opinion, unfairly dismissed by the intelligentsia because he chose to concentrate on writing humor. His prose is as tight and punchy as anything by that Hemingway fellow. If you appreciate good writing and haven't read Benchley you really are missing out on a very pleasurable experience. I enjoyed reading through your great blog and seeing your point of view. Gluyas has such a clean line! 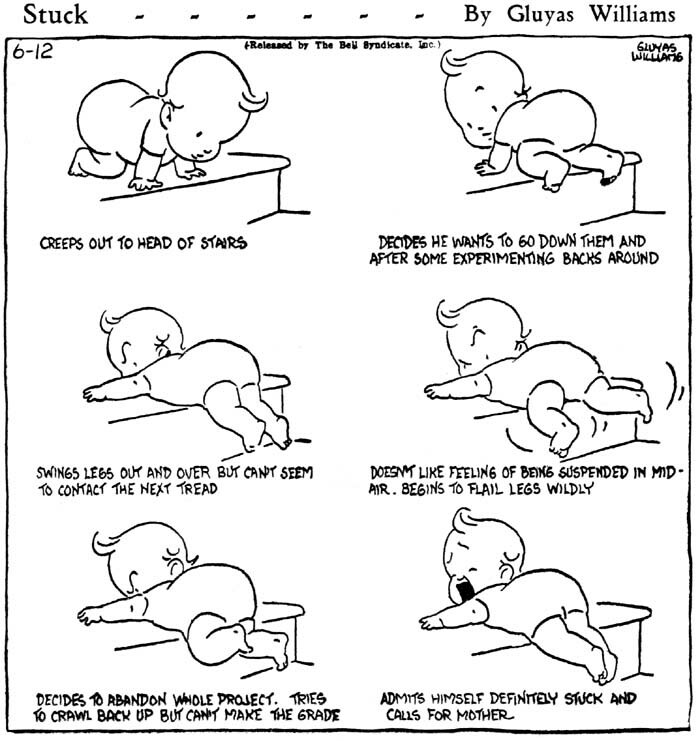 Nothing really obscure about Gluyas Williams, just thought I'd share a few of his great cartoons. In the trinity of the most popular untitled comic panels (H.T. Webster, Clare Briggs, and our man Gluyas) I'd put him as number one for cartooning ability, number two (after Webster) for humor. He certainly was a distant third in popularity in his day, owing, I imagine, more to the strength of his syndicate (Bell for most of the run) compared to the other two. 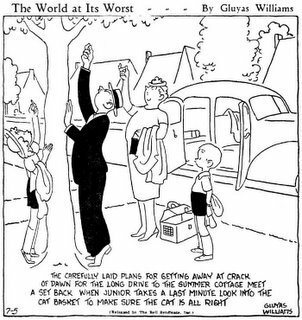 The earliest Gluyas Williams newspaper panels I've found are from November 1922, and the feature ended sometime in 1947. 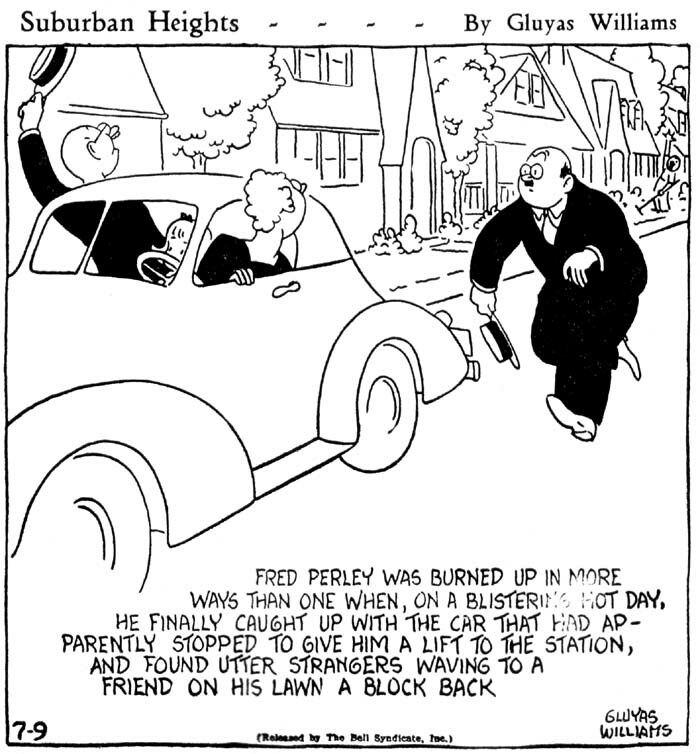 Williams was also well-known for his New Yorker cartoons and book illustrations (most notably for Robert Benchley's works). WE pronounce it with long u short a, Williams is your basic common pronounciation, which varies based on the part of the country you are in. My late father got into a disagreement with a bookstore clerk, as to the proper pronounciation of Gluyas, the clerk kept saying Glu-I-as, and was quite adamant about it. My father wrote out a check for his purchase and signed his full name David Gluyas Williams. Is my attempt at humor really that bad? I do, of course, know how to pronounce the man's last name. Gluyas Williams is one of my all time favorites, too bad you don;t see it anywhere very often. The very first color supplement produced on a high speed newspaper press was issued by the all but forgotten Chicago Inter Ocean in 1892. The first color supplement was issued to commemorate the Democratic national convention held there. The color supplement became a regular feature of the Inter Ocean, and was produced sometimes as many as three times per week during the Columbian Exposition held in that city in 1893. 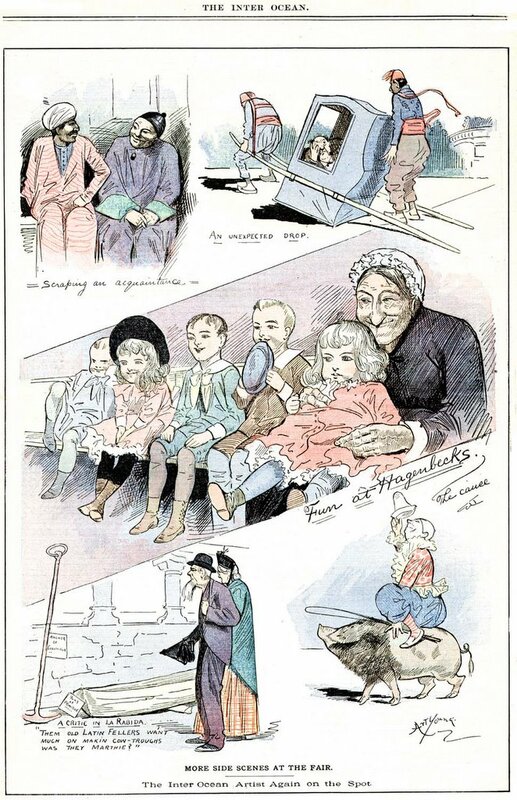 Most of the color material was in the form of drawings of exposition attractions, but there were also many humor and editorial cartoons printed in color. During this period the color cartoons were mostly produced by a pair at opposite ends of their careers; Thomas Nast and Art Young. 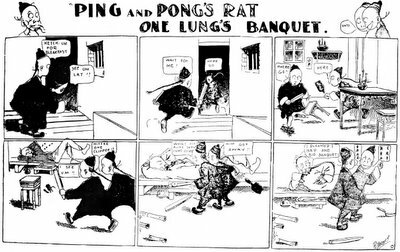 After the close of the exposition, the newspaper changed the color supplement into a children's section, and soon the very first regularly appearing color newspaper comic characters were cavorting through its pages every week - the Ting-Lings, a group of cute Asian children. Yes, Virginia, they do indeed predate the Yellow Kid. But I'll save discussing the Ting-Lings for future blog entries. 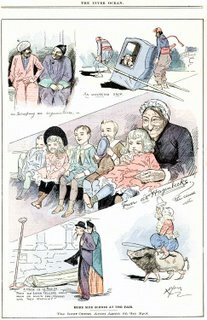 Today we have a wonderful Art Young cartoon from the Inter Ocean color supplement. My source material is missing the front cover of the section, but I believe this page is probably from the 11/12/1893 section, which was Art Young's last appearance there before the section changed over to juvenile content.